LESTER HOLT, anchor: in turmoil. Tonight, the fragile Greek government is at a stalemate and the debt crisis and economic chaos could have a dangerous ripple effect around the world. NBC 's Michelle Kosinski is in Athens for us tonight and she has the latest. MICHELLE KOSINSKI reporting: It is a Greek drama the whole world has been watching. The dubious protagonist, Prime Minister George Papandreou , barely won a confidence vote after proposing a coalition government that might mean the end of his job. But the opposition is calling instead for elections, which could delay Greece 's desperately needed multibillion-dollar bailout by Europe. Mr. JUSTIN URQUHART STEWART (Financial Analyst): You couldn't really make it up if you put it in a novel. No one would believe it. And that will reflect on markets and that will reflect on trading and nervousness, particularly within the banking system. And that's the really dangerous bit. KOSINSKI: The specter of Greece defaulting, leaving the eurozone has rattled world markets. Some even see it as potentially precipitating a second global recession. Unidentified Man: If they don't do something fast, all hell will break loose, probably. KOSINSKI: And if you think the US isn't affected, on the day Papandreou considered putting the bailout issue to a risky public vote, US stocks slumped. When he changed his mind, they bounced back. As of now, he remains in power with the hope Greece 's Parliament will approve the bailout. Another looming question is will Greece be able to continue to enact the necessary austerity measures like raising taxes, slashing salaries that so many here feel are grossly unfair. Thirty-three -year-old civil engineer Marcos Ballas has a good job, but hasn't been paid in three months, surviving by living with his parents. Mr. MARCOS BALLAS: It's like a cow. You take milk, how much milk you can take? The cow will stop. You have to feed the cow in order to have milk. KOSINSKI: Coming days will be critical in bringing Greece and world confidence in the eurozone back from the brink. Michelle Kosinski , NBC News, Athens. 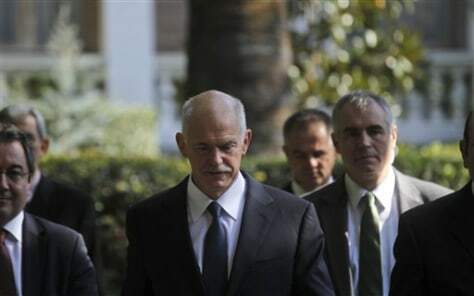 Greece's Prime Minister George Papandreou after meeting with Greek President Karolos Papoulias, in Athens on Saturday. Embattled Papandreou launched efforts to form a four-month coalition government, arguing the move is vital to demonstrating Greece's commitment to remaining in the eurozone.